Ever wonder how professional guitarists manage to get such a wide presence out of their sound? Odds are they’re doing so with chorus, a common effect that thickens up an instrument’s overall sound and often adds a shimmer or liquid tone to the mix. Chorus effects work by doubling your guitar signal and then adding a slight delay to the second signal, giving the impression that two instruments are playing together. When you really crank up the values of the chorus unit, you wind up with wet textures and swirling modulation. Chorus effects are often used subtly, but they can make a big different in how your guitar sounds. 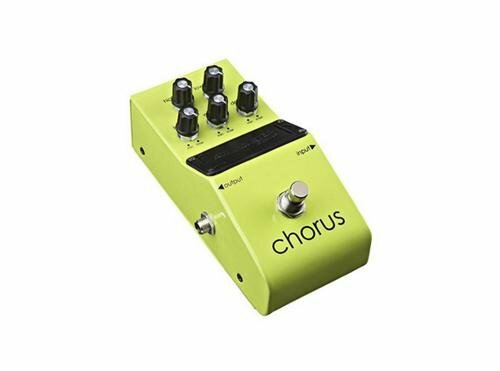 Chorus pedals generally feature a knob that lets you control how much of the signal is being affected, the depth of the effect being applied, and the rate at which the doubling occurs. Whether you’re looking to simply thicken up the tone of your playing or hoping to experiment with the sonic capabilities of this famous effect, a chorus pedal can be a powerful addition to your guitar arsenal. 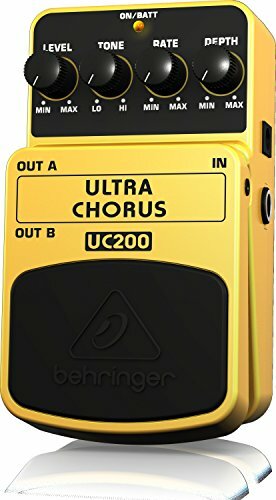 Behringer’s Ultra Chorus UC200 is a fine chorus unit with a very friendly price tag. The UC200 features four knobs that give you full control over effect level, depth and rate of the effect, as well as one for tone. Like most pedals it can be powered by either nine volt battery or DC adapter, while an LED indicator light has been included to let you know when the effect is engaged. Guitarists should take note that while the UC200 can be purchased very inexpensively, it makes up for this by using plastic in its construction as opposed to metal, meaning it is less durable than other pedals. However, it should hold up fine as long as you aren’t stomping on it. 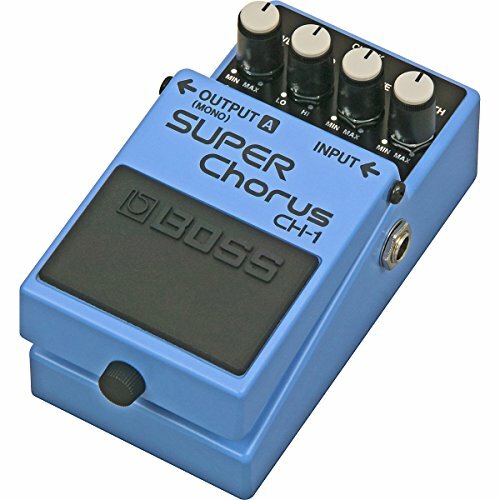 The Boss CH-1 Stereo Super Chorus is another fine pedal in the esteemed brand’s arsenal of effects units for guitarists. 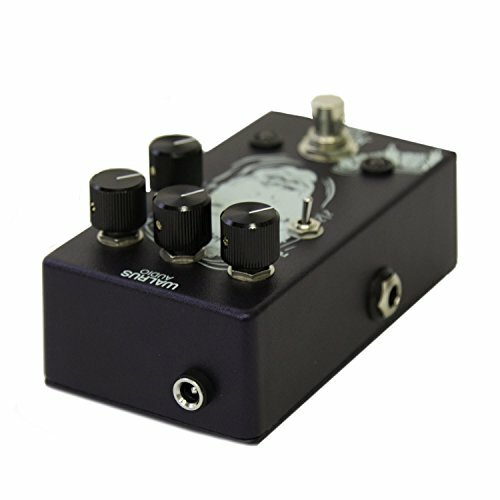 This pedal is housed in a super sturdy metal case, with the option to power via nine volt battery of adapter. Boss is known for producing great effects units, and the CH-1 provides a super thick stereo chorus sound that will increase the presence of your tone. 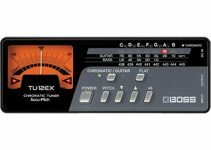 Four control knobs are included that allow you to tweak the effect level, depth, rate and EQ of the chorus. If you’re looking for a great chorus unit, you will be in good hands with Boss. Donner’s Tutti Love Chorus pedal is modeled after classic chorus units, providing the much sought after tone of analog effects. Donner keeps it simple, providing a knob to control the effect level, depth and rate of the chorus, as well as a true bypass switch so you can seamlessly turn the effect on and off. An LED indicator is included so you can easily check if the effect has been engaged. The pedal features a solid aluminum alloy build that will stand up to rough treatment, while players have the usual power options that are standard on most pedals. 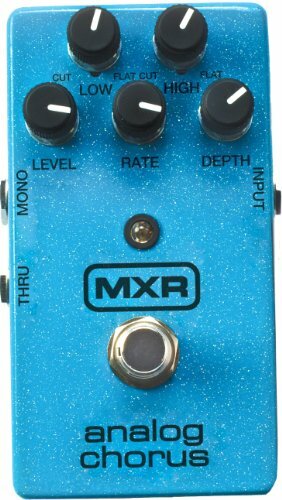 The MXR M234 Analog Chorus is another fine effects unit in the category, ranking as one of the more customizable chorus pedals out there. With a total of five knobs, you have a lot of control over the output sound, with a knob for the usual effect level, depth and rate options, as well as two flat cut EQ knobs. Guitarists looking for that old school sound will be pleased to know that the M234 features full analog circuitry. The pedal comes in a heavy duty housing and includes the usual power options. Electro-Harmonix offers up a very straightforward outing with the Neo Clone Analog Chorus pedal. 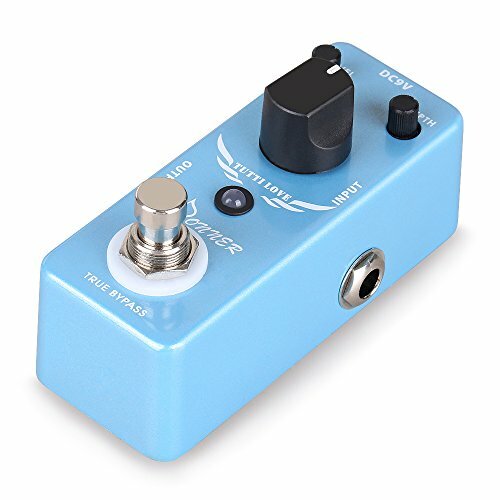 This unit cuts down on controls to offer players a solid chorus effect with minimal tweaking, with one knob for rate, a toggle switch for depth and a true bypass for turning the effect on and off. 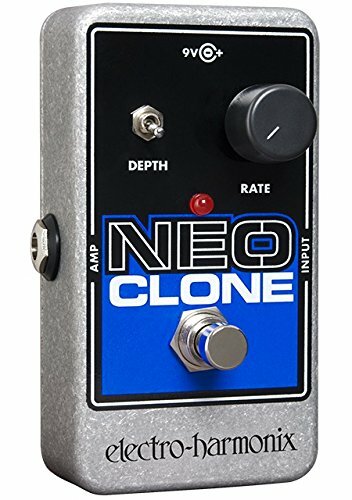 While you sacrifice versatility with the Neo Clone, you gain a solid effect that will help you achieve those liquid textures made famous in the 90’s. This pedal is packaged into a compact but durable metal frame that will save you space on your pedal board while providing huge sound. 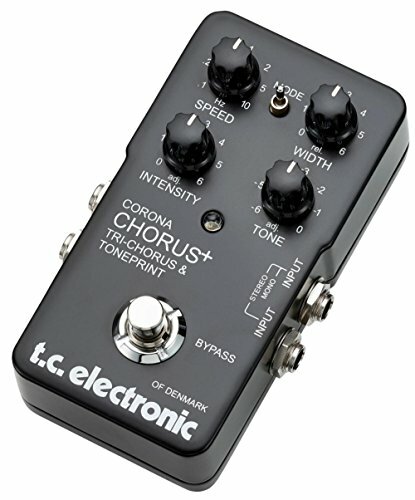 TC Electronic’s Corona Chorus is an outstanding unit with a very versatile palette. This pedal has a lot of different controls that can be tweaked, ranging from the standard effect level, depth and rate to a tone knob and a switch that lets you toggle between three different modes: chorus, toneprint and tri-chorus. 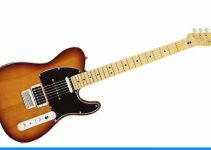 The range of control options means you can play anything from a light shimmer to swirls of modulated noise. A true bypass and LED indicator are included as well, and the unit can be powered by battery of adapter. If you’re looking for a top end chorus unit, you can’t do much better than Walrus Audio’s Julia Analog chorus pedal. 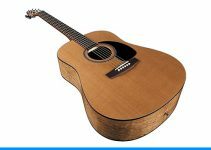 The usual rate and depth options are included, as well as an additional control for lag and a knob that lets you toggle between dry, chorus and vibrato modes. To make this pedal more versatile, Walrus Audio have also included a vibrato function with selectable LFO, giving you tons of modulation options. While this pedal comes in at a higher price than the average chorus unit, you definitely get plenty of bang for your buck. Joyo’s JF-37 is a great example of an inexpensive analog chorus effect with a straightforward design. 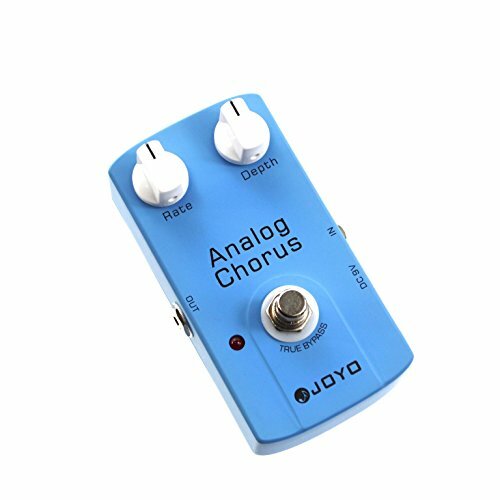 Where other pedals come brimming with knobs, Joyo knocks it back to basics, including knobs only for rate and depth and a true bypass switch to simply turn the effect on and off. While it may lack versatility, a simple chorus effect will apply to guitarists just looking to beef up their sound. While the ultra low price and top notch sound are enough to carry this unit, Joyo takes it to the next level with rugged construction that will help up against rough handling. Starcaster’s offering in the chorus category is a great low cost option that still has plenty of knobs to let you dial in the perfect sound. The standard effect level, rate and depth controls are here, while high and low filters have been included as well to help you get the right tone out of the effect. Other notable features include analog design, rugged metal build, an LED indicator light and the usual power options. For the low price, you would be hard pressed to find a chorus pedal with so many high end features. 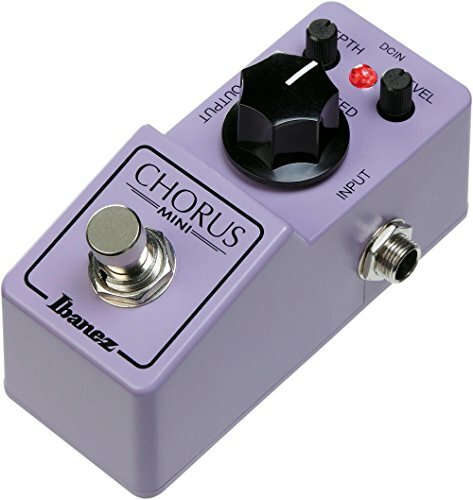 We’ll wrap this guide up with another fine offering in Ibanez’s Chorus mini pedal. Don’t let its small stature fool you as this pedal really packs a punch when it comes to chorus effects. Ibanez keeps the design simple with a large knob for controlling rate, as well as two smaller knobs for level and depth and a true bypass switch. This unit uses full analog circuity in its construction, meaning you’ll have no trouble achieving that class analog chorus tone. This pedal’s footprint is far smaller than the average effect unit, which will save you plenty of space in your effects ensemble.